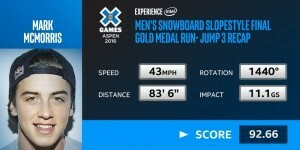 During the 2016 X Games Aspen, the Intel® Curie™ compute module shared real-time performance data for athletes in the Men’s Snowboard Slopestyle and Men’s Snowboard Big Air competitions, including how fast competitors moved, how many degrees they rotated in the air and how hard they landed. The instant data from Curie showed that Mark McMorris, who took home the gold in the Men’s Snowboard Slopestyle, started his final jump at a speed of 43 MPH, achieving a rotation of 1440° on his backside triple cork. View more on the press kit.